Eight years ago, plans to raze the three-story corner building at 300 Grant Avenue and construct a new ten-story building, with 45 condos over two floors of retail and parking on Downtown parcel were approved. Waylaid by the great recession, the development never materialized. And last year, new plans to simply expand the existing building, by combining it with the adjacent one-story building at 272 Sutter Street and adding a fourth floor of office space across the entire site, emerged. But those plans have now been abandoned as well. And once again, the existing building on the corner is slated to be razed. But rather than building condos, or up to the full 130 feet in height for which the corner is zoned, the new new plans call for merging the 300 Grant and 272 Sutter Street parcels and constructing a contemporary six-story building designed by MBH Architects on the site, with retail across the first three floors and new office space above. 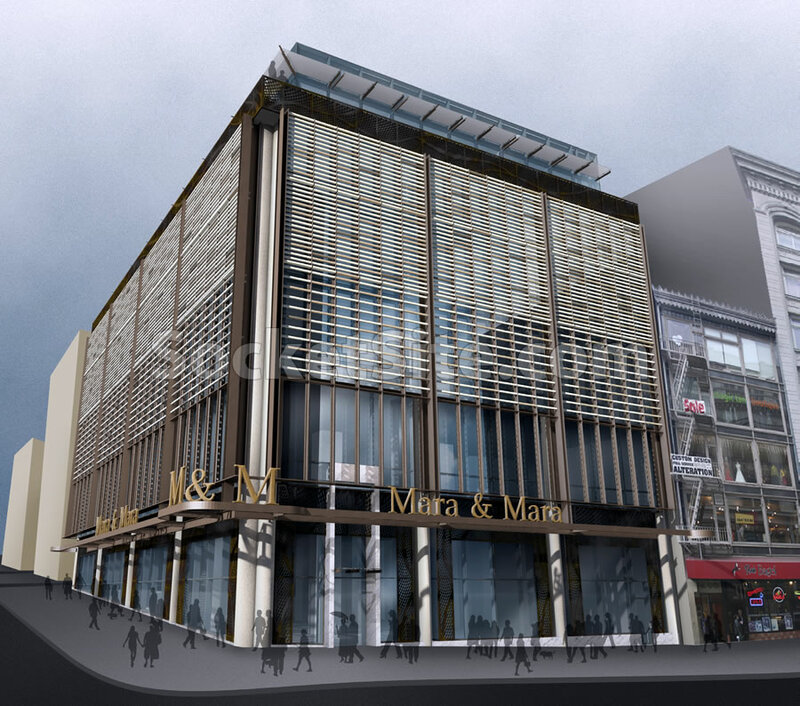 The building would feature a Carrara marble entry portal, decorative plasma cut bronze panels at the ground floor and a bronzed steel and ceramic scrim across the upper floors of the building, with the sixth floor setback from the street. 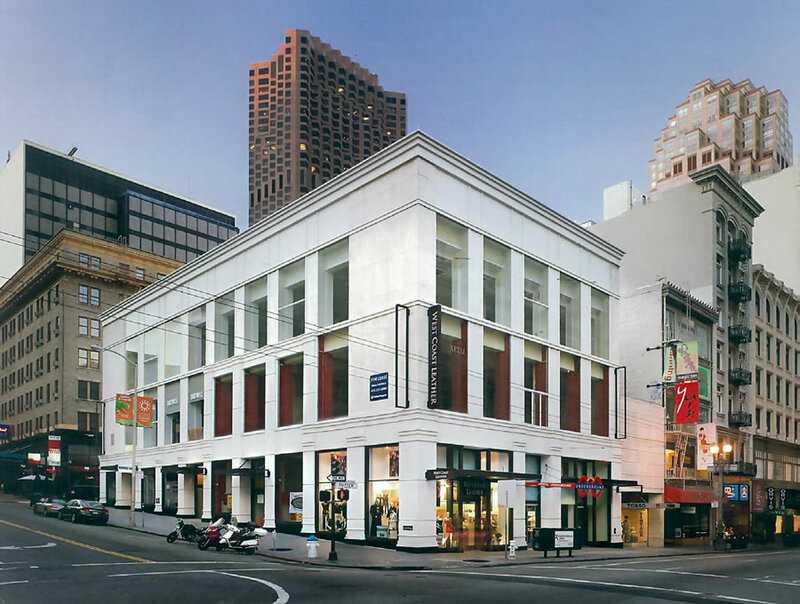 And as the 300 Grant building falls within San Francisco’s Kearny-Market-Mason-Sutter Conservation District, the proposed plans will be presented to San Francisco’s Historic Preservation Commission’s Architectural Review Committee next week. It’s ugly, but beyond that the city has no business approving new office space. Just don’t build any! Yes keep new jobs to a minimum! Please kill the local economy! Agree on everything. Also, put toll booths on every entry point to SF and charge everyone $20 to enter. Also, all renters should pay a tax for the privilege of even staying in the City. It’s coming if people don’t start making wiser commute choices. The problem is not the office space, it’s that they are not maxing out the envelope with residential like the previous schemes. Seems odd. Great looking modern project: really like the nicely detailed window wall screening. Glad to see this happening. Either raze and go up the full 130ft or keep the existing building as is with some upgrades. The new proposal is rather mediocre. Agreed, but our resident expert differs in opinion, so we will run with that and call it a day. Seriously, they could have squeezed a couple more floors out the design as the building sits on a prominent corner with an 8-story structure across the street. Let’s see: replace an existing building at the heart of Grant Avenue – IIRC once called the “most beautiful street in America”, and still largely coherent architecturally – with what can be fairly described as something resembling a giant air conditioner. But, hey, it has upscale materials and SOTA technology – “plasma cut” is soooo much better than other methods – so expect a fawning article from the self-styled “Urban Design” Critic in that O(ther) P(aper). I came back to this post to see if maybe I would like the rendering. Instead, it gets worse each time I look at it. I can’t believe anyone would consider replacing the existing structure with this heaping mess. The very first art deco-style design was fantastic. Even the second design, while restrained, was fitting to the area. This is abhorrent. Contemporary architecture that will be dated and an eyesore in under a decade. Much like all the “modern” junk built in the 60s through the 80s. That was once “modern” but now we wish we could undo it. The Sunsetization of SF has spread throughout SOMS and much of the City. Now its come to the heart of the City. Future generations will ask what were they thinking. Its time for a new regime at City Hall. From the Mayor to the PC. Bland boxy architecture with no sense of street presence. Cold, sterile. No intimacy. This summer has been brutal fog-wise, compared to the previous few years. Having friends who live in the Sunset and visiting them recently it’s like – well it’s like. You fill in the rest. Dave@ the Sunset, Parkside and inner/Outersunset are always fogged in durning the summer. You must not be living in the City. Suggest you take a trip to Beijing or a Euopean Coty. This is what you will find. It is called modern architecture. There is going to be a change at City hall in November,,, 4 liberal progressives are going by bye. I think the building proposed shows grace and future thinking. The buildings around this project are lite in color with a stone facade. This is a welcome change. It does show grace, style and elegant restraint. And NO, it does not need to go any higher. Good urban architecture respects and works with the existing surrounding scale. Not EVERY high rise building in New York is smack next to another equally HIGH building. Variation and modulation are key to creating good urban design. When will the arm chair critics here begun to pause and think about that? It should be the full height in a dense area like this. You’re the hacky arm chair critic who has no consistent positions, just strongly held one off opinions. And why should it be the full height as you say? Good urban design takes in the consideration and context of the surrounding area. Read my previous comment again and take time to understand what it means. I re-read your comment, I think you should too. You provide generic cliches about urban design (straight out of “101 things I learned in architecture school”), but you do not say why they apply to this site or the height of this proposal. Good architecture does “work with the existing surrounding scale”, so why couldn’t this building be built to 130 ft? If you want it to be similar the surrounding scale, there are the building across the street and down the block. If you want “modulation” there is the existing, shorter, building next door. What does not make sense to me is why in a dense urban area, with transit near by, why a site should be under built. If you want a couple levels of office and retail, ok, but lets build out the rest with housing or more office. What is currently proposed leaves a lot to be desired. But you offer no reasons as to why it should be taller, other than it “should be”. That, in itself, has zero basis in solid, urban design principles. Most commenters here when they “want” a building taller, they simply say because they want it that way. it borders on mindless commentary. That is my argument, that sites should generally be built to the greatest potential. I believe that this context and site can sustain a bigger building. We need the added density, it is a city after all. You however have not provide any argument other than just saying the words “urban design” over and over. And once again, your argument is not based on any sound professional urban design criteria. 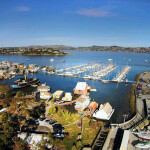 And urban design criteria and best practices are what make San Francisco livable, walkable and humane. Your argument is solely based on one criteria as you say “greatest potential”, which you mean height, and NO OTHER factor to consider. I’m glad you are not a developer, architect, or urban planner because you would then have San Francisco built out to the character of a Shanghai or Hong Kong. Thank fully we have solid professionals designing here who will never let that happen. And that’s a good thing. Futurist, it should ideally be full height because denser development is better for the environment, supports shorter commutes (given proximity to high capacity rail), and supports more dynamic, interesting, lively neighborhoods. You are thinking about the building in isolation rather than it’s role in a big city. The extra height would be especially beneficial if it included housing. This part of town really needs housing. I walk down this street at night frequently because I work in the area – it’s eerily desolate after 7pm. Because this part of town isn’t a real neighborhood yet. You need people to make a neighborhood. You need mixed-use to support full day activity. At the same time, if the developer/owner penciled this out and this is what they want to build, as long as its within zoning, fine. It’s their land and money, not mine. Why should I have the right to dictate what they do with their property? Maybe the market can’t support a taller building at this location right now. On the other hand, if it’s arbitrarily shorter now because of the fake progressives on the BOS, then that’s a problem. @ Chad: I had to chuckle at your kind of logic. 1. the developer made the decisions. 2. We’re not a big city. 3. This neighborhood does not really “need” housing; it’s a commercial/retail area. There are virtually no residential services anywhere nearby. 4. your logic of “good for the environment” because of “shorter commutes” is REALLY spinning that one, way out of control. @futurist, you are wildly uninformed and rely on rhetoric rather any facts or logic. Saying the words “urban design principles” without providing any is not a convincing argument. You’ve appointed yourself an urban designer, but fail to acknowledge any of the basics other than your own concept of “form”. Density, transit, and other non-formal aspects of urban design are important to how cities function. To discard them because you like the facade of this building is to show a very shallow and superficial understanding of what design is. No intimacy? Are you a buildingosexual? I mean… It looks like it was designed (or reclad) in 1968. I do like modern design, but the drawing looks like a suburban strip mall dentist office from yes, 1968. What a loss. Some incredible condos could have been built there. More housing! The existing building was built in 1908 and does show that it is a historic resource. How is it that they are able to tear it down to build what amounts to Kayne West shades? They could have at least tried to do something akin to 170 Grant. Hell, the first two designs looked great. Did architects simply go bonkers in the past decade and give up? The 2007 and 2008 plans look eons better than this dreck. What is your source that 300 Grant is a Historic Resource? It’s not listed by the city. You’re right, it’s not. SF’s PIM site lists it as historic resource present, but it’s in the unrated category. Point still stands, the first two instances of the development were much better alternatives to this. This is a very weak re-use of Renzo Piano designs/ details. Embarassment. Is this supposed to be an upgrade to whats there now? I understand the lot merger and vertical expansion, not questioning all that. Its just a visual downgrade. 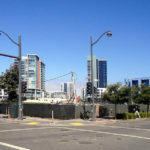 The reason the 130′ condo building was not built was vehement opposition from the residents at 333 Grant condos kiddie corner across the street, a building probably 100′ tall itself. Oh the horror of it all. Once again, the views of a few is trumping the wants and needs of the many. When will people wake up and realize that this conservative, faux-preservationist, suburban view of the city peddled by rich homeowners is actually harming, not helping the city? Mara the Evil One? Two of them, no less. Certainly, the upper floors are darker, with little or no light. The retail leasing is very slow on Sutter street. Even with its grant address its activity is low and Banana Republic building could also add another large block of retail vacancy in the coming years. Why not take it easy on people and give them the opportunity to redevelop the property and lease the building rather than harshly criticize them like you are the ones with your money invested in the building? Do you guys on here like empty storefronts? Very 1970s. And it’s underbuilding the site–something that shoudn’t be allowed in this critical location (SF needs minimum height limits as well as maximum ones in Union Square and the Fidi on both sides of Market in order to minimize sprawl). I agree the upper floors (all 9 of them that should be there) should NOT be residential at this location. Office is fine with me, not big corporate office but smaller community-serving office like all the watch repair places above the former Shreve location or perhaps professional offices (doctors, dentists, small law firms). But maybe they should find a retail tenant and figure out how many floors that business needs before deciding how many more floors there are to fill. PS–I meant to add that I actually prefer what’s there now to the newest proposal. We really, really, really do not need more retail space in SF or anywhere. We are more over retailed now than we have ever been. Housing IS needed. This is true across the United States, of course. I think we have like five times the retail space as, say, Germany, on a per capita basis. Still…if there is going to be retail, it should be in the core retail district. I like this design . It reminds me of some of the high-end retail 3-5 story buildings on Chater Road in HK. Namelink for a streetview example. Yes, it is similar to the one in HK. I think you meant Charter Road. And yes, it’s successful there too, especially how it offers scale relief to the many supertalls surrounding it. What people here (not you) need to understand how urban design in dense city settings is the importance in the balance of scale, height, bulk, setbacks, materials, glazing in relationship to surrounding buildings. An area of all tall buildings is no more successful than an area of all short buildings. I spelled Chater Road correctly, FWIW. I suspect the play by the developer/owner is to create a location that is suitable to a tier 1 global retailer who will pay a premium rent for as a branding exercise. I hope it works(!) The build has to be well-executed for such an outcome. To me an unattractive design. Yes, it does look like a window mounted A/C unit. Do we want more office space? There seems to be plenty of jobs in SF. We are a little short on housing.